Need a Dishonored hoodie? How about a limited edition Dragonborn statue? The newly-launched Bethesda Store has you covered. Over the course of the last decade Bethesda Softworks has become a major force in the gaming industry. 10 years back they were almost solely know as the people behind the Elder Scrolls series, but in our modern era Bethesda is the publisher of such massive critical and financial hits as Fallout: New Vegas, Dishonored and, of course, The Elder Scrolls V: Skyrim. Despite its increased prolificity (yup, that's actually a word), Bethesda has been something of a disappointment in comparison to other big publishers like EA and Activision. Not because its games pale in qualitative comparison, but because Bethesda just doesn't seem to have the same killer instinct as its peers when it comes to milking a franchise's teats until they're red and sore. At least, that's what we would've told you yesterday. This morning, Bethesda officially launched the Bethesda Store, a one stop shop for all of your Bethesda-centric videogame merchandise needs. A quick trip to the Store's website -- this is 2013; physical store locations are SO last year -- reveals a host of items spanning Bethesda's most popular franchises. Dishonored, the most recent Fallout games and The Elder Scrolls franchise are all represented in force, with a few items from DOOM, Quake and Wolfenstein rounding out the offerings. Cool, right? Well actually, that hinges pretty massively on just how much you like Bethesda's games and how much disposable income you have on hand. The prices featured at the Bethesda Store are not insignificant. To wit: A t-shirt emblazoned with the cover art for the totally fictional Grognak comic book found in Fallout 3 will set you back $18. A pair of Fallout-themed sneakers runs $85. Then there's big ticket items like the aforementioned Dragonborn statue which is currently only listed to draw $100 deposits from interested parties. Its final price and release date are not currently available, but based on other limited edition Skyrim statues, we'd guess the final tally to be close to $300. 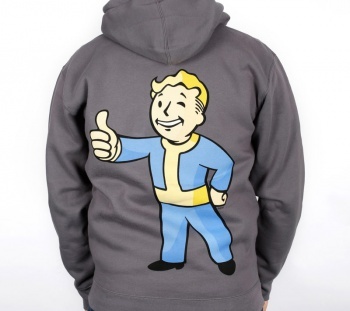 Still, if you're a huge Bethesda fan this new online store stands as the best way to get your hands on official gear. Plus, in fairness, this DOOM shirt is awesome. My 13-year-old self just forced modern me to buy two.